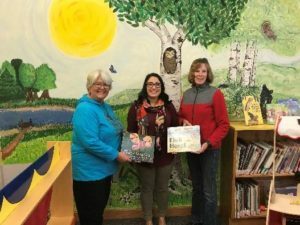 We purchased two children’s books at the conference to donate to Forest County public libraries. The titles are Fish Hotel and The Magic Goggles. Vi Lamers and I will be delivering them over the next several weeks. The picture above shows our delivery to Stephanie Schmidt, the new director of the Crandon Library. Borrow these books for your children and begin their education about shoreline ecology. This year I was so proud to be present as our own Harry Resch received the prestigious Stewardship Award in the Educator category at the annual awards banquet. 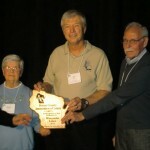 The award is prestigious because the competition comes from throughout the state of WI. That’s a lot of Lake organizations and a lot of competent employees and volunteers to compete against. It is not the first time that FCAL has received one of these awards. Les Schramm was chosen during Lee Lamers term for his work fighting Eurasian Milfoil on Roberts Lake. We have an awesome group of volunteers here in Forest County and I am proud to be a part of this great organization. That being said, none of us are getting any younger. We have been without a secretary since December and our Treasurer has promised us only one year of service so we will be needing a new volunteer for that position in October. Please consider becoming a volunteer for FCAL. You will learn a lot and meet other exceptional people who care about our beautiful lakes and streams. You can check us out by coming to a board meeting any 3rd Friday at 9AM in the lower level of the Crandon Library. Also encourage your lake leaders to attend the FCAL Fall Forum on Saturday, August 18th at the Lake Lucerne pavilion. Grant requests must be submitted by September 1st. Education/ Sharing: To educate the Forest County public and riparian owners of issues and to facilitate dialogue between organizations and governmental bodies. Long Range Planning: To participate in long range planning efforts regarding the water resources of Forest County. Regulatory/ Enforcing: To facilitate efforts of the governmental bodies to enforce regulations which affect inland water body usage and water quality. Cooperation: To provide a vehicle for greater cooperative efforts between riparian owners, riparian users, appropriate governmental agencies and the citizens of Forest County. Board meetings are held the third Friday of each month starting at 9:00 a.m. . All meetings are held in the lower level of the Crandon Public Library. 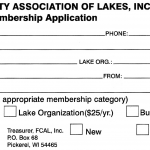 Membership form available online. Click on application to download an application in .pdf format. Photos from some of our association activities.